While that soccer ball is always waiting in the yard for a swift kick, another item rests patiently in the grass close by. Who would get their two-year-old a frisbee? Would you? Well, I did not. It happened by default. Earlier this summer Braeden watched some kids playing in the Copper Harbor park. One of the little girls came over and asked, "Braeden, do you want to come play with us?" It was a precious moment for Mom. My little boy was invited to join the group in the park for the first time. Hooray! They were all playing with a frisbee. Braeden took his turn running after it and throwing it back to the kids. They were having so much fun that I didn't even have to watch him like a hawk. I got to chat with the other moms like a normal parent for once! After the crowd scattered, we went back home. Somehow we ended up with a frisbee. This bright orange disc sat on my counter for a couple weeks. Every time I saw it, I thought, "What are we going to do with a partially dog-chewed frisbee?" One day it caught Brady P's eye. "Eh!" he shouted pointing to the frisbee. "Do you want to play frisbee?" I asked him. He put his hand on his head for a yes. After a couple times throwing the frisbee in the yard, I realized that Brady P. was a frisbee-throwing machine. He can throw it so well that adults can catch it. And he loves throwing it so much, that we had to look up the sign for frisbee, so he can tell me when he wants to play. It's definitely everyday. I like it because it doesn't continue rolling into precarious places. We'll play frisbee in the yard. We'll bring it on our walks, so he can throw it, run after it, pick it up and throw it again (keeping the walk in motion). He'll throw it in the bushes and I'll make him find it. We'll bring it to parties, so he can show other kids how to play. It always dawns on me how well he throws it when I watch other kids lob it, drop it or accidentally throw it backwards. He's got good glide, aim and distance with that thing. And he likes to practice different techniques. Last weekend, we brought it to the U.P. Down Syndrome Association's summer picnic in Escanaba. Yes, we drove 4 hours one way for a picnic, but those events are good for both of us. 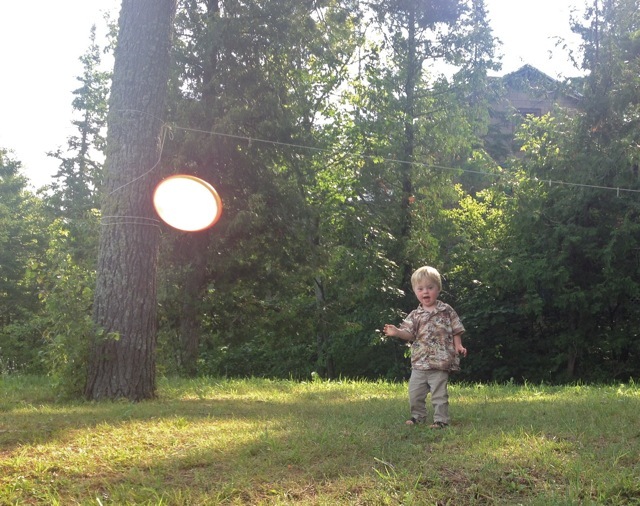 So Braeden got to show the kids how to play frisbee. His frisbee was so often in use that I wondered where it was half the time, but my heart smiled when I saw kids and parents tossing it around in a group. It was a cool event. 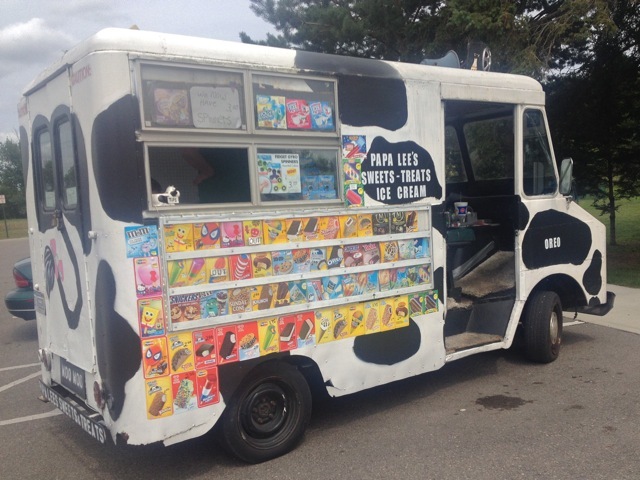 The ice cream truck even came! I have never seen a real live ice cream truck tinkling its music down the road, but there it was. And the kids rushed right to it. Braeden was a big fan. Okay, so was I.
I also enjoyed my time talking with the other parents. It's a rare party that I get to attend where all the parents understand what I've been through with Braeden and even have their own heart-breaking, yet triumphant stories to share. 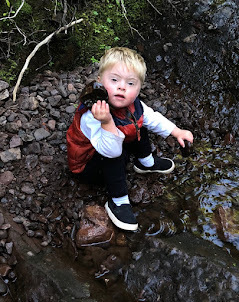 I believe it's healing for all parents of a child with unique needs and medical struggles to be able to share their stories and empathize. After our hearts were warmed, I found the frisbee again. Then we gave our good-bye hugs and drove back north. Amanda...Such a good mother you are. Now, now...just say thank you very much. I love your stories about any adventure small are huge. From a retired teacher who has worked with many children during the day light hours...keep up the good work. I know you will.